Rufford Abbey was founded by Gilbert de Gant in 1146. The charter confirming the foundation was granted by King Stephen on Christmas day of that year. Rufford was a Cisterican Monastery, a daughter house of Riveaulx Abbey in Yorkshire. The abbey was situated just to the West of the King's Highway to York which passed from Nottingham northwards through Sherwood Forest, and the Abbey was an attractive stop-over for weary travellers on the long road through the forest. The Abbey sat towards the northern edge of a vast tract of heathland, meadow, woodland and farmland consolidated from the possessions of the villages of Rufford, Crately, and Inkersall, granted to the Abbey. Rufford village had 8 families when the monks arrived, but was abandoned by the end of the Thirteenth Century. Crately was slower to become deserted, but villagers eventually moved to settle in nearby Edwinstowe and the village of Wellow (see Rufford Charters entry for information about the grants of lands and the Charters recording them). The Church of the Abbey was dedicated to St Mary, and was built in the remote wastes and woods of Sherwood by the Cistercians, who favoured the isolation and separation from the world provided by the forest. The Abbey complex included the Church, Cellar, Lay Brothers Frater, Cloister, Kitchens, Monks Frater, Warming House, Undercroft and Dormitory above, Inner Parlour, Chapter House, and Sacristy. The surrounding landscape included areas of Woodland: 'ye abote wode', 'Abott Ymmslow', and 'burne abotote wode'. There were also large areas of heather lyngges, or wastes known as 'the Forest'. The valley of the Rainworth Water to the south of the Abbey was managed as Meadows to provide winter fodder for large numbers of sheep. The Cistercians were prolific sheep farmers. The Abbey organised much of these land-holdings into 'Granges'- most of them within a days walk of the Abbey- the best know being Inkersall Grange which sat on Rainworth Water on the southern-most extent of the home estates. 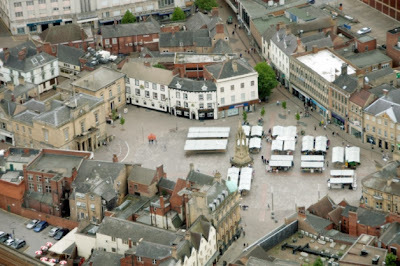 As well as the demense farming which provided income for the Abbey, the Monks also possessed large parts of the town of Rotherham in Yorkshire which provided a vast amount of taxable income for the Abbey. The Abbey was a popular over night resting place on the great road through the Forest and would have provided welcome accommodation as night fell over the desolate heaths and remote woodland of the High Forest (see A Journey through Sherwood Forest: Rufford Abbey to Nottingham post). Accommodation was provided for free by the monks- so it was essential that the monastery could provide for itself and visitors. The large amounts of farmland kept by the Abbey was therefore of great importance to ensure they could provide for all these travelers. 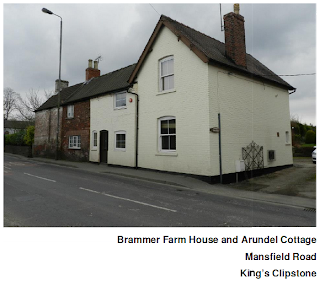 These could include Royalty, and in 1290 Queen Eleanor of Castile, wife of King Edward I stayed here while Edward held Parliament at his nearby Royal Palace and Hunting lodge at Clipstone (see Parliament Oak: Icon of Sherwood Forest entry for more details ). In fact the Abbey was among her final resting places as she was ill during her stay there, and died during an attempt to move to Lincoln for Spiritual and Medical help. Rufford was a part of the fabric of life in Sherwood Forest for 400 hundred years. It would sadly come to an end in the 1530 under King Henry VIII along with all other monasteries in the Kingdom. At the Dissolution of the Monastery the Abbot was accused of being incontinent with two married women and 4 single women- six of the monks were said to be desirous of exemption from their duties- and the monastery was dissolved in 1536 (it is quite likely that these charges were trumped up as they were very convenient for the crown- however Priests were often badly behaved at times in Medieval Sherwood Forest). Despite this inglorious ending, Rufford Abbey passed into the hands of rich landowners and eventually emerged to become a Country Park in the present Day with parts of the Medieval Abbey surviving within the later house. These include the Lay Brothers Frater and the Undercroft which can still be visited to this day. The Archaeology and History of Medieval Sherwood Forest Facebook page now has over 3,000 followers! 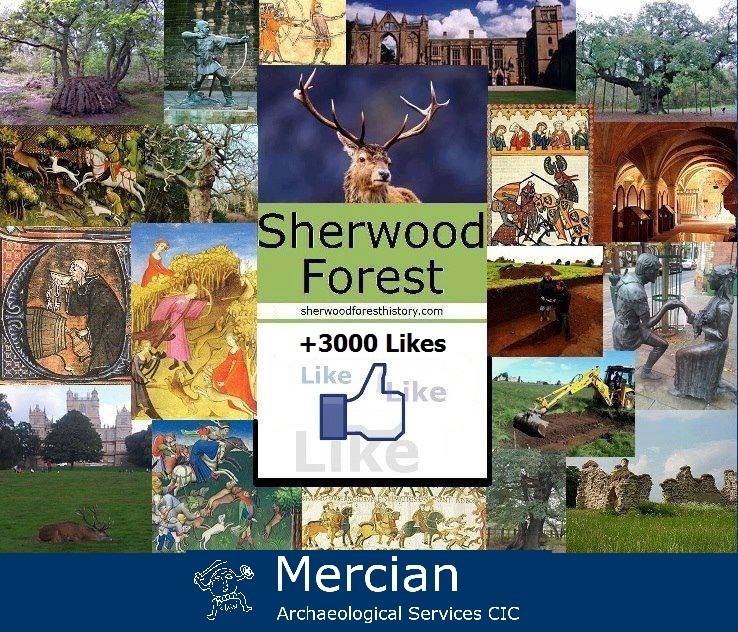 Mercian Archaeological Services CIC would like to thank everyone for the amazing support they have shown to their Archaeology and History of Medieval Sherwood Forest project. 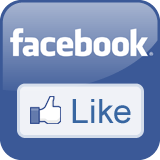 Reaching 3,000 Facebook likes is a fabulous landmark that just goes to show how interested people are in the heritage of this wonderful area, and how close the subject is to so many peoples hearts. 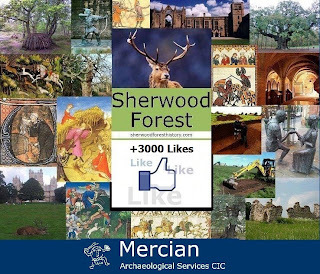 This project is ran by Mercian Archaeological Services as part of their Community Archaeology outreach and is all about promoting Sherwood Forest and its fantastic heritage to as wide an audience as possible around the world. This support helps to give a platform for the work undertaken by ourselves and many others in Sherwood Forest, and helps to promote the forest as a whole- reflecting its changing medieval boundaries, which stretch far beyond those in the modern landsape. This collective work hopefully goes someway to helping to protect Sherwood Forest for future generations to know and love too. Please spread the word and help promote this marvelous story as far as we can. facebook.com/sherwoodforesthistory - please like the page. facebook.com/MercianArch - please like the page. St Nicholas' Church is one of Nottingham's three medieval religious foundations that survive to this day. The building which stands today however was built in the 17th century. The Church of St Nicholas' is first mentioned in the foundation charter of Lenton Priory from 1103-8 where an annual pension was confirmed to the prior and convent of 15 shillings annually. It is therefore believed to have been founded before the Norman conquest, probably in the eleventh century. The medieval church contained a Chantry dedicated to St Mary- possibly situated in the Lady chapel which is also mentioned in the records. There was also a Guild or fraternity of St Mary associated with the church. With the Norman conquest the church found itself in the French quarter of Nottingham outside the walls of the castle- this location would eventually lead to its downfall. Speeds 1610 map suggests the medieval church had a nave and possibly one or two isles, along with a west tower complete with a spire. Stapleton in his 1903 book 'churches and monasteries of Old Nottingham' suggest the tower and spire were of Decorated Gothic architecture. This medieval building has sadly been destroyed, but the story of its downfall is fantastic in itself. It is well documented that Colonel Hutchinson Governor of Nottingham Castle ordered its destruction in 1643 during the English Civil Wars. The church was garrisoned by Royalists who used it to fire on the Parliamentarians in the castle. The diary of Colonel Hutchinson's wife, Lucy states ' There was an old church called St Nicholas' Church, whose steeple so commanded the platform that the men could not play the ordnance without woolsacks before them. From this church the bullets played so thick into the outward Castle Yard that they could not pass from one gate to another, nor relieve the guards, but with great hazard' (Stapleton 1903). After the town was cleared of Royalists the Colonel had the church taken down so theat it could not be used against them again. In 1678 a new church was erected in brick which exists to this day, and is the subject of the photograph above by Mercian Archaeological Services CIC. Mercian Archaeological Services CIC are please to announce that they have now officially running the Sherwood Forest Archaeology Project as of June 2013. 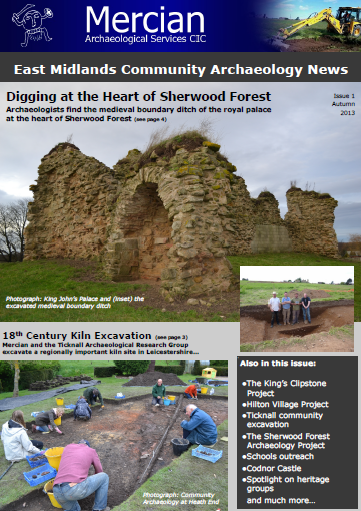 The Sherwood Forest Archaeology Project aims to research and promote Sherwood Forest - the most famous forest in history. The ethos of this project is to promote the Archaeology, History and Heritage of Sherwood Forest, its landscape and people. It aims to support and promote the work of individuals and groups (often voluntary) who undertake work in the Forest. And to raise the profile of this heritage and work to the widest possible audience. The project website has had close to 100,000 page views in under two years and the Facebook page has close to 3,000 followers so far! In February 2013 Mercian Archaeological Services CIC (www.mercian-as.co.uk and www.facebook.com/MercianArch), a Community Interest Company undertaking Community Archaeology Projects in the East Midlands, ran an archaeological project to excavate test pits in the village of Kings Clipstone in the heart of Sherwood Forest. The project was aimed at examining among other things the development of the settlement in Medieval times. The village north of the Mansfield Road consisted of long and narrow tofts and crofts which extended backwards from the road to the River Maun to the north. Evidence from the excavation suggests that this part of the village was formed in the 13th century, as an expansion of the settlement around the royal palace that occupied the ground to the south of the road. The interim report for this project will be available to download shortly. 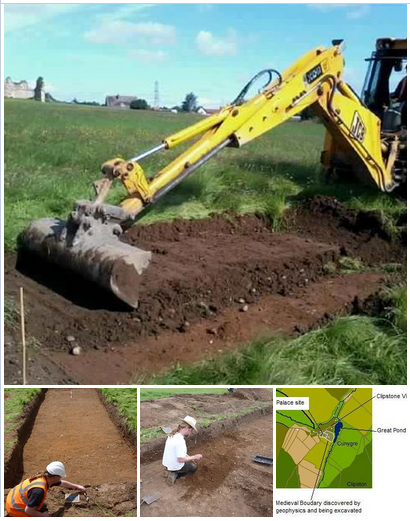 In the summer of July 2012, James Wright of https://www.facebook.com/ArchaeologyHistoryKingsClipstone and Andy Gaunt, David Budge and Sean Crossley (now Mercian Archaeological Services CIC) excavated trenches across the boundary ditch of the palace complex. The Spa Ponds- Medieval fish ponds in Clipstone Park (near Forest Town). On the western edge of the former royal deer park of Clipstone, in the heart of Sherwood Forest- are a series of large ponds fed by a spring and a tributary of the River Maun. They are overlooked by steep slopes of ground to the east which once housed a fortification built by Edward II in the early 14th century. This fortification was Clipstone Peel- built as a refuge during 'a time of political turmoil. The peel was constructed in timber except for a stone gatehouse. When the peel was dismantled during the reign of Edward III, the gatehouse was left standing, and the small ruin known as Beeston Lodge is now all that remains' (Wright, 2008). Overlooked by this fortification the ponds were kept for provision of fish for the king- and represent a massive undertaking by the crown. They are a hugely important part of local medieval heritage, and are an important part of a national story relating to the time of Edward II. Archaeologist Andy Gaunt and site owner Mickie Bradley at King John's Palace. 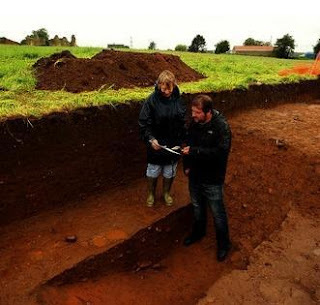 Taken from Nottingham Post Friday 20th July 2012: 'ARCHAEOLOGISTS now believe they have found the "medieval centre" of Sherwood Forest in a dig at a 12th-century site. 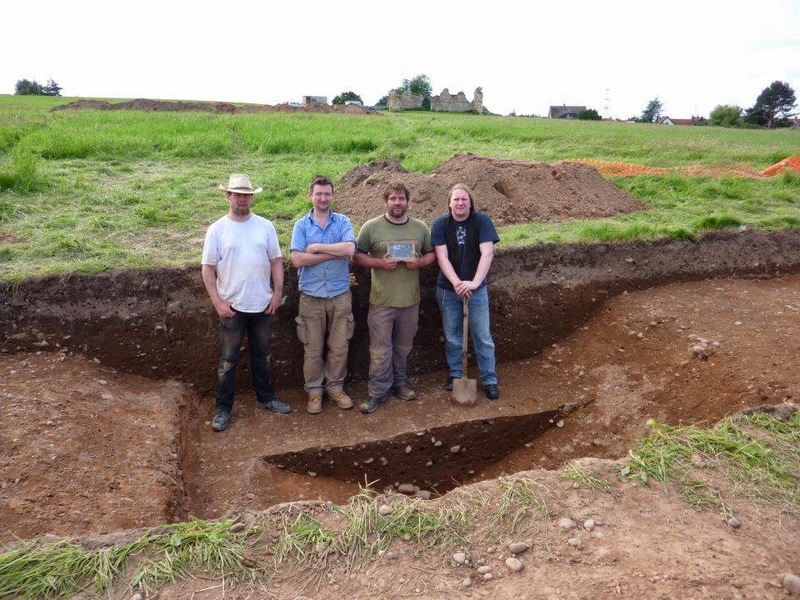 Specialists have uncovered more vital information about King's John's Palace, in King's Clipstone. 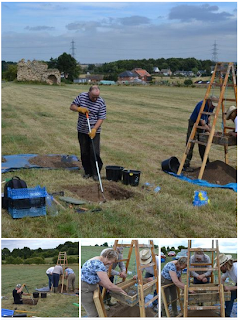 The dig over the weekend was the latest in a series which have aimed to uncover the historical secrets of the ruin. Excavations proved that the exterior defences encircled a much bigger area than first thought and seem to finally prove that it was once a huge royal residence. Notts archaeologist Andy Gaunt, who worked on the dig, said: "I think the site is the medieval centre of Sherwood Forest. For a couple of hundred years this is where all of England's kings were going. "We've proved what the medieval boundary of the site was." St Mary's Church in Nottingham is the earliest church in the town and is mentioned in Domesday Book. It was at the heart of the original Saxon town. The earliest of the surviving ballads of Robin Hood- Robin and the Monk (talkyng of the Munke and Robyne Hode)- written down around 1450- mentions St. Mary's Church in Nottingham. Robin is said to have visited the church (he was devoted to the Virgin Mary) when he was spotted by a Grey Monk whose alarm forced him to be captured. The tale tells of his subsequent rescue from the Sheriff by Little John and Much the Miller's Son. The church was almost entirely rebuilt in the Perpendicular Gothic style in the 15th century, and is a fantastic example of this style of architecture- with its south and north transept windows utilising the innovations in architecture to create almost entire walls of glass. The church was under the control of the nearby Lenton Abbey in the medieval period, and was a the heart of religious life in the town. The summit of Thynghowe, photograph from Friends of Thynghowe Group. 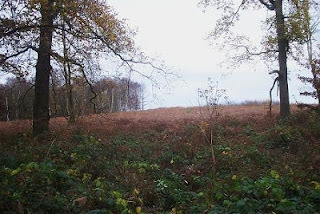 In the heart of medieval Sherwood Forest on the edge of the ancient crown woodland of Birklands is a hill and mound marking the boundary of 3 parishes. This hill is now called Hanger Hill, but its ancient name was Thynghowe. The name of the site indicates its former use as a meeting site either for the parishes upon which it bounds, or for a wider regional scale. The derivation of Thynghowe is þing haugr, meaning ‘hill of assembly or meeting place’. (EPNS 1940). “þ” is the Saxon letter thorn pronounced “th”. The site could have very ancient origins indeed. The name is of Viking origin, and the site may have occupied an older mound still. Thynghowe sits in a remote location that could have been an important meeting point way back into pre-history. The site was rediscovered by Lynda Mallett, Stuart Reddish and John Wood using a perambulation document from 1816. They arealways looking for interested people and volunteers to join in with their archaeoloigcal fieldwork and historical research. Please see their website for more information: Friends of Thynghowe group.